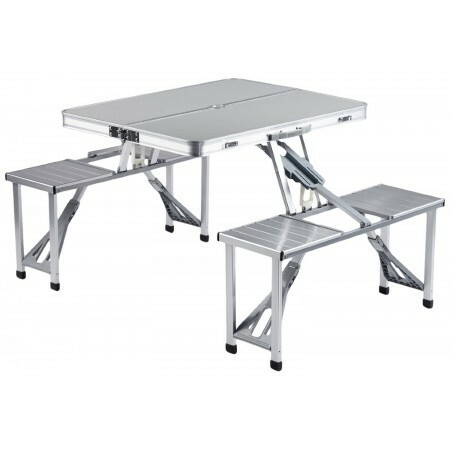 The aluminum folding picnic table offers you a strong yet lightweight aluminum construction with solid stools for 4 adults. 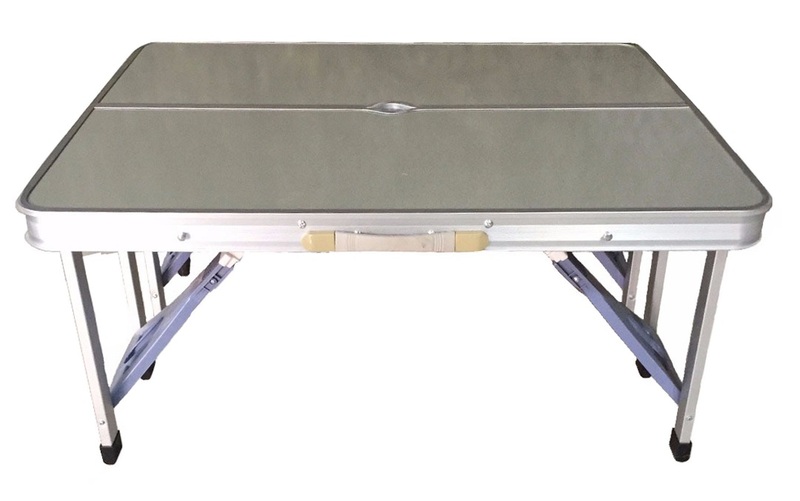 It is made from strong aluminium and steel with plastic bracings, the MDF heat resistant table top makes the surface very durable and has a weight capacity of 60kg while each seat can carry a maximum weight of 100kg.Perfect for picnics, camping, garden barbecues, and outdoor occasions. 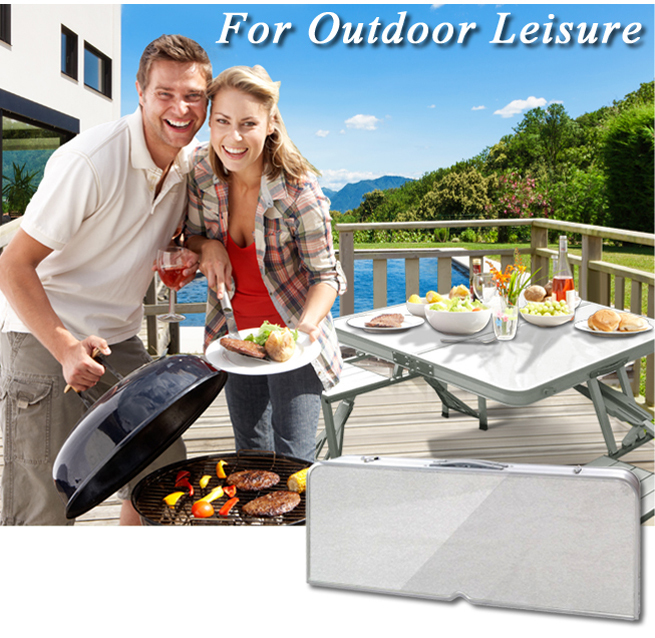 Portable carry case folds out into a picnic table with four chairs.Lightweight and durable aluminium construction. Slatted seats to drain rain that accumulates on surface. Easy wipe clean PP plastic table top.The portable picnic table set contains four chairs and folds into a compact case with a handle, enabling you to easily store and carry it with the rest of your camping gear.The portable folding picnic table has a durable and lightweight aluminium construction for long-lasting outdoor use. 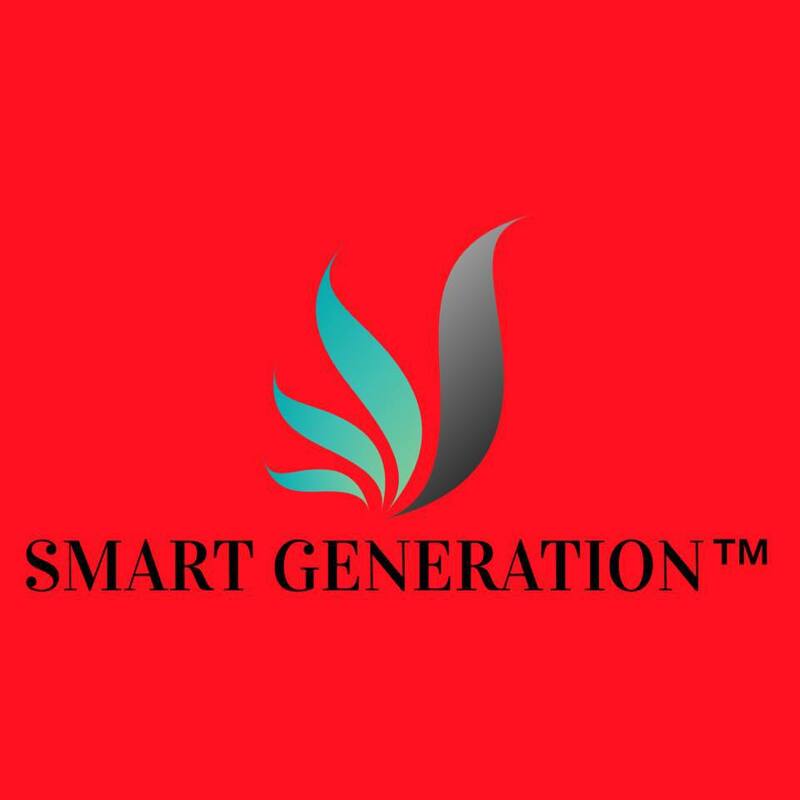 You can set it up, quickly and easily, in well under 30 seconds. Simply open the carry case, flip the table over, unfold the legs, and turn the table back around.To protect you from the sun and rain, you can insert a parasol into the centre of the folding picnic table&apos;s easy wipe clean PP surface. The camping picnic table also has plastic feet for enhanced stability and slatted seats to drain any rain that accumulates on the surface.Note: When unfolding the legs, always push the slides up to support the brackets and provide the legs with maximum rigidity. Plastic braces on either side of the table should be placed into their designated holes, creating a stable surface for a comfortable dining experience. Note : Please note there is a misprint in the user manual of this product, it states the table weight capacity is 30kg, however the actual weight capacity is indeed 60kgs. This table durable but lightweight and with its aluminum top it is very easy to wipe clean.